From Goodreads: "She doesn't see dead people. She senses when someone near her is about to die. And when that happens, a force beyond her control compels her to scream bloody murder. Literally. Kaylee just wants to enjoy having caught the attention of the hottest guy in school. But a normal date is hard to come by when Nash seems to know more about her need to scream than she does. And when classmates start dropping dead for no apparent reason, only Kaylee knows who'll be next." I was at my library the other day to pick up a book that I had on hold, I was wandering the shelves when I came across this one. I've heard a lot of good things about this book and author throughout the blogosphere and on Goodreads. I wasn't sure what to think of the blurb for this one, minus the screaming bloody murder, it sounded a bit similar to The Body Finder by Kimberly Derting. In that both lead characters have senses about death. That's pretty much where the similarities end. 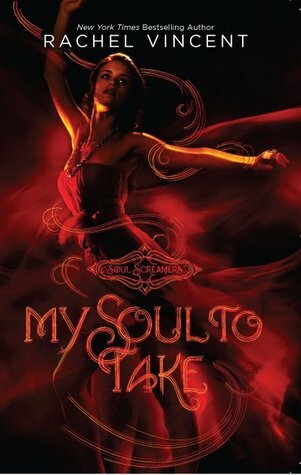 My Soul to Take follows the story of Kaylee, your not so average high school girl! She sneaks out to a club one night with her friend, Emma. They are dancing the night away with some pretty cute boys when Kaylee gets a seriously strange feeling about one of the other club go-ers! She doesn't know how, but she knows that poor girl hasn't got long left to live. She starts having a sort of panic attack and she has to physically stop herself from screaming because the urge is so great and she doesn't want to cause a scene. What makes things worse? Nash, one of the popular kids from school has witnessed all of this. Just great. He will go back to his friends on Monday and tell them all about her little break down. Not only does Nash not tell his friends what happened, he is the one who manages to calm her down. Kaylee offers Nash a ride home from the club, it's the least she could do. They start talking and Kaylee comes to realise that maybe Nash isn't as bad a guy as she once thought. He listens to her crazy death prediction and doesn't make her feel like a fool. The next day Kaylee switches to the news and sees that the girl from the night before, who she predicted would die. Did die! It all goes somewhat down hill from there for Kaylee. But at least she has gotten some answers about who, or what, she is! Turns out she is a banshee, who screams a song for the dead to suspend the spirit long enough for them to make peace. I have never read a book about banshee's before, nice and refreshing for a book not to be about vampires or werewolves, don't get me wrong I still love books about these, but it's not like the majority of YA books out there are about banshee's, right? So this was a welcome change! I really enjoyed this book by Rachel, it was imaginative and creative. Her writing was easy to read and made for a quick finish. I finished this in one sitting, I just needed to know what was going on! Since it is a mystery why Kaylee feels and acts the way she does when she senses someones death. I liked not knowing everything that was going on too early in the book, left some of the mystery to it. Especially since even Kaylee didn't know or even think that she (SPOILER ALERT) wouldn't be human, so why would I as the reader think any different? I really don't know why it took me so long to pick up this book but I'm glad I finally did! I look forward to reading the second instalment to this series, to see the relationships in the book develop and to see what will happen to Kaylee next! If you have read this one, what did you think of it? Banshees are new to me too! I still haven't read this one but I do have it at home. It does sounds awesome! Book 3 is my fave, I am nearly finished it My Soul To Keep ..errr... I am 10 days overdue at local library, better finish it tonight. I love the whole Banshee/Bean Sidhe thing. I'm loving both boys but currently they need a big slap from me!! !